Charity Begins at Home …… in the ger! 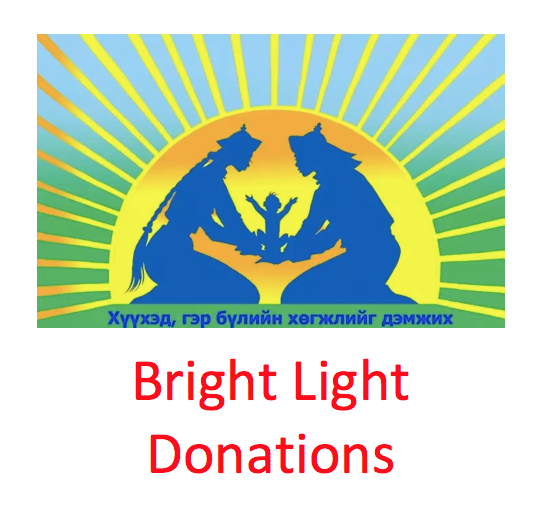 Paul and Sebastian are calling on friends, family, and those who just stumble onto this site, to consider donating to the Bright Light Organisation in Mongolia. Partaking in a car rally is highly exciting, and very, very indulgent. One could be selfless and, instead of rallying, donate to others who have less opportunity. We chose both, and hope that by drawing attention to our adventure we can also contribute to helping those who don’t get to do car rallies, people who get few indulgent choices in life. Why the Bright Light Centre? Well, it so happens Paul has (in spirit) ‘adopted’ a wonderful Mongolian couple, Bukhu and Chimka, who live in Sydney. CLICK HERE for more on their first encounter. Through Bukhu, Paul became acquainted with Munkhchuluun Ganburged, Bukhu’s sister, and the work she was doing as the main organiser of Bright Light. Despite being dealt a rough deal herself, she has been a bright light for those less lucky. For Munkhchuluun’s story CLICK HERE. The Bright Light Organisation aims to support disadvantaged females in a very practical way, by teaching them life skills. Whilst female education is not unusual in Mongolia, there are those less fortunate who miss out for all the usual reasons – poverty, drug and alcohol abuse, physical and mental illness etc, etc … and there is no government safety net. We want to help, and have set up a Donate Button below (active link to Donate button). The aim is to raise $10,000AUD, which will be used over 18 months to help about 380 women and girls. Most are in single-parent households, with 980 dependent children, living in the Ger district (i.e. the shanty towns, or slums). And whilst a ‘ger’ or ‘yurt’ is delightfully romantic and appropriate for the countryside, when in an urban setting, without infrastructure, living cheek by jowl, ger life is far short of idyllic. Similar programmes have been run by the Bright Light Organisation for five years, allowing women and girls with little money and no prospects, to earn an independent living, giving them the chance to save for the future. Giving them hope. Munkhchuluun has explained the background and outlined a programme with timetable and budget CLICK HERE for more information on the Bright Light programme. Wages are minimal, as many of the staff, including Munkhchuluun, are voluntary. Childcare is a cost because most of the women could not partake otherwise. There are so many charities to donate to, why this one? Because…we’re never going to ask you again!!!! …and it’s a good politically correct cause …and you’ll feel even more generous because it’s not tax deductible …and when Paul’s happy, Sebastian is happy, and when Sebastian is happy, the Bristol 403 is happy. And we want the Bristol 403 – “Silvia” – to help make the women of Mongolia happier too. Posted in BLOG, Supporting Bright Light on December 16, 2015 by Admin.